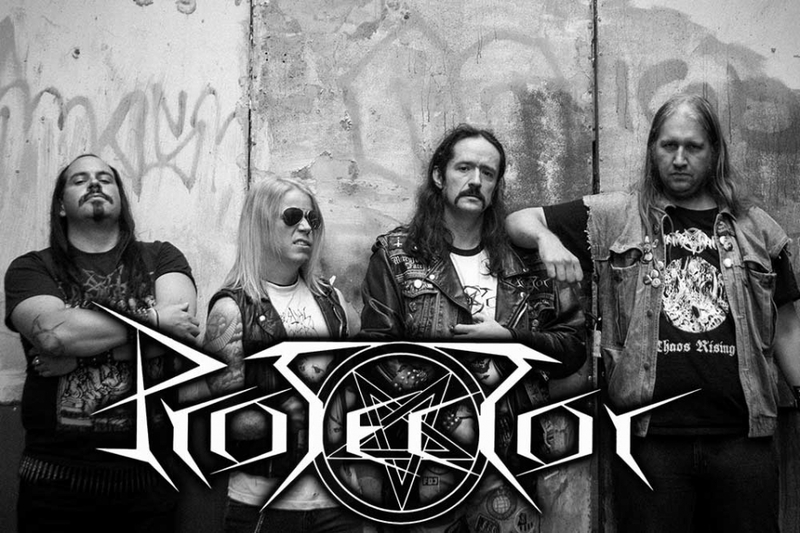 PROTECTOR, one of the first headliners for Obscene Extreme 2015! Had this band received a similar support from the label at the start of their career like the other squads in the same vein at that time and their line-up been a little bit more stable to put it simply, their name would have occupied your jeans blouse as much as is the case with Sodom or Kreator. Their debut album „Golem“ released at the end of 80`s that put them at the top of thrash / death scene and the time when they rampaged at the concerts with the bands like Wehrmacht or Napalm Death was followed by a slump and an ultimate end in 2003. A couple of years ago (in 2011 precisely) they returned full of power and are ready to get your heads banging! PROTECTOR!!! The Thrash / Death Metal band PROTECTOR was formed in the summer of 1986 in the German city of Wolfsburg, and by the end of the year they had recorded their first demo. In the eight years that followed, the band recorded two EPs and four LPs. They played live all over Europe, with, among others, SODOM, KREATOR, WEHRMACHT, NAPALM DEATH and TANKARD. During the first years of it's existence, PROTECTOR went through several line-up changes. In 1994 the band decided to take a one year break. When that year had passed only drummer Marco Pape was motivated enough to continue to work with PROTECTOR, and did so together with three new bandmembers. This version of PROTECTOR existed until 2002/2003. By the end of 2005 former PROTECTOR vocalist Martin Missy, together with swedish musicians Carl-Gustav Karlsson (drums - among others GRIEF OF EMERALD and MASTEMA), Michael Carlsson (guitar – MASTEMA) and Mathias Johansson (bass – vocals in SUICIDAL WINDS and AXIS POWERS), formed the PROTECTOR coverband MARTIN MISSY AND THE PROTECTORS. They played live all around Europe until late 2011, when they decided to officially reactivate PROTECTOR, and record a demo. In May 2013 the band went into the Sunlight Studio and recorded a new full lengh album called ”Reanimated Homunculus”. The album was released by High Roller Records on friday the 13 september 2013.